What Supplements Dry Up Sinus Congestion? What Is Good to Drink to Break-Up Phlegm? A buildup of phlegm in your throat and lungs can be caused by a number of ailments, such as colds or allergies. Phlegm buildup can leave you coughing constantly, sore in the throat and chest and unable to breath clearly. Luckily there are concoctions you can drink utilizing a number of ingredients which can help to loosen phlegm and thus expel it from your throat, nose and chest. 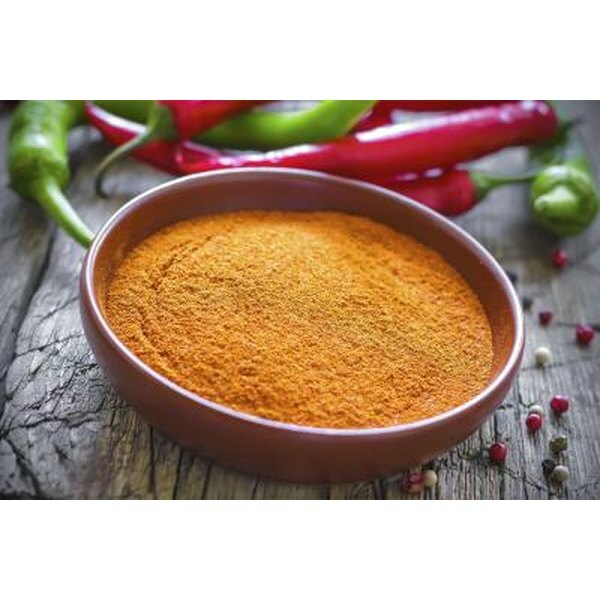 Cayenne pepper is a popular spice that can help to shake up the phlegm in your throat and clear airways. To make a drink from this spice, boil a cup of hot water and add a half of a teaspoon to it; then stir and sip. If you can’t stomach the bold spicy flavor, add cayenne to your favorite hot tea blend or some beef, chicken or veggie broth to sip on. Honey is another soothing remedy for both sore throats and phlegm overproduction. Like cayenne, honey can be added to hot water and sipped on. You could also mix it with cayenne in hot water to add extra punch to fighting phlegm; or add it to a tea blend. Use raw honey, which contains more health benefits than processed honey brands. Find raw honey at your local grocery or health food store. Ginger is a healthful root that can be utilized for phlegm treatment. The added bonus with ginger is that it can also reduce inflammation in the throat, ease upset stomachs, lessen coughs and muscle aches, all of which can be symptoms that accompany phlegm. Mix a teaspoon of powdered ginger with a cup of hot water -- steep a couple of pieces of ginger root in boiling water for 10 minutes -- or mix it with honey and cayenne for triple the phlegm-fighting power. Lemon is a tangy remedy to help sooth a sore throat while breaking up phlegm. Steep a few slices in a cup of hot water and sip or mix it with one of the aforementioned remedies. When utilizing lemon avoid sugary juices or those that contain lemon flavoring and stick with fresh lemon juice. Lemon juice also has vitamin C, which can help your immune system fight off colds. Can Ginger Help You Lose Weight?